거리에서 화분 무더기들을 발견했다. 더럽고 관리가 안 되어 보였다. 거기에 꽃을 심기 위해, 화분 주인을 만나기 위해, 자주 가본다. 화분의 주인을 만나서 거기에 꽃을 심자고 말해보지만 왠지 어색하고 쉽지가 않다. 그러고 보니 이전에는 누군가에게 부탁할 일이 별로 없었다. 지금까지 내가 살아온 세상이 참 좁았다는 생각이 들었다. 함께 꽃을 심은 사람들은 환하게 웃었다. 그 웃음이 진짜라는 생각이 들었다. 집에 초대되어 식사를 대접받기도 했고, 할머니는 그녀의 첫사랑 얘기를 들려주셨다. 꽃을 통해서 사람들과 통했다고 느꼈다. 내가 살아있다고 느꼈다. 생각보다 빨리 꽃은 시들었다. 사람들은 떠나고, 집은 허물어지고, 화분들은 버려졌다. 그것을 보고 있자니 가슴이 먹먹했다. 내가 감당할 수 없는 너무 많은 인연을 만들었나. 할머니는 여기에 왜 꽃을 심냐고 하셨다. 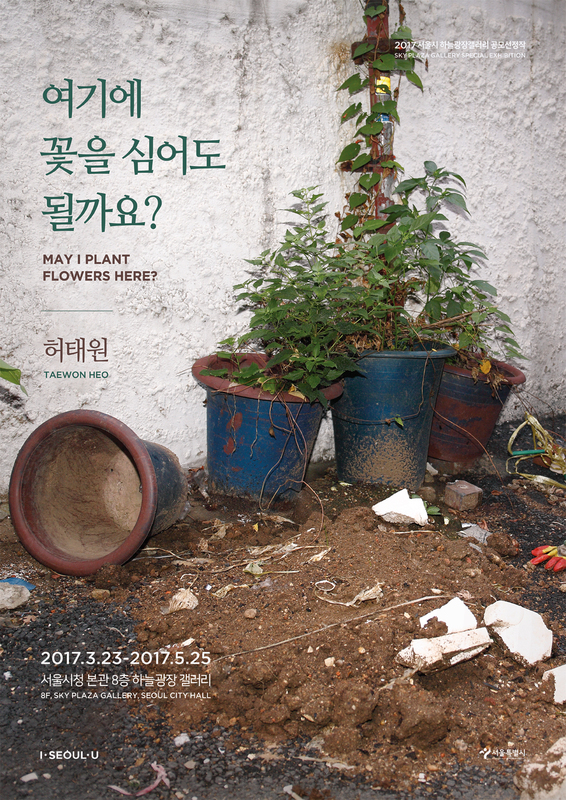 May I Plant Flowers Here? I came cross piles of empty flower pots on the street. They all seemed to be dirty and not used anymore. I had often visited that place to manage to meet the pots’ owners. Finally I met some of the owners and suggested to plant flowers there. It was not-so-easy attempts to me since there was not much to ask for something. There were other sides of world I hadn’t known. They smiled brightly when planting flowers. I thought that it was a real smile. Some of them invited me for lunch and one old lady talked me about her first love story. I felt I became connected to others through flowers. I felt I was alive. The flowers withered more quickly than I thought. People were leaving, houses collapsed, and the pots abandoned. I was heartbroken looking at these scenes. Did I make too many relationships that I can't afford? The old lady asked me why I even bother to plant flowers here. 우리 가족의 소망을 담아 화분을 꾸미고 꽃을 심어 작가와 함께 전시공간에 공동정원을 만들어 보세요. Carrying the hopes of participating families, you may decorate pots and plant flowers with the artist to form a Sky Communal Garden. 시민들의 꿈이 꽃처럼 피어날 수 있도록 커다란 서울공동화분에 각자의 소망과 희망을 글과 그림으로 적어보세요. Writing and painting about our wishes on the flowerpot. 허태원은 홍익대학교와 시카고예술대학원에서 페인팅을 공부하였다. 삶과 예술을 잇는 다양한 방식들을 실험하고 있는 작가는 <페인팅(Painting)>(갤러리팩토리, 서울, 2013), <금천공동정원>(금천예술공장, 서울, 2011)을 포함하여 7회의 개인전을 가졌고, <사진과 사회>, <동네미술>, <창원조각비엔날레>, <프로젝트 대전 2012: 에네르기> 등 다수의 기획전에 참여하였다. Taewon Heo studied painting in Hongik University(BFA) and the School of the Art Institute of Chicago(MFA). His works have been explored various ways of relating everyday life with art. He had 7 solo shows including “Painting”(Gallery Factory, Seoul, 2013), “Geumcheon Communal Garden”(Seoul Art Space Geumcheon, Seoul, 2011), and participated in multiple group shows such as “Changwon Sculpture Biennale”, “Photography and Society”, etc.